Expandable Coolife Soft-shell 3color Jacquard Oxford (YD000064BAA_3) is a three-piece modern spinner and expandable luggage set with the TSA lock. It is a popular product with 66 customer reviews and ratings at the moment and scores 4.7 out of 5 stars, which is a clear indication of customer satisfaction. You can get it in either black, brown or navy whichever color you like or prefer but the colors are easy to identify on the airport carousel. The smallest 20-inch luggage weighs 6 pounds and measures 23 x 10 x 14 inches including all parts, the medium suitcase weighs 7.3 pounds and measures 16.5 x 11 x 27 inches and the largest 28-inch weighs 9.7 pounds and measures 18 x 12.5 x 31 inches. The smallest 20” has a big pocket at the front and the medium and the large suitcases are expandable by about 15%. As you may have noticed in the photos the colors on the 3color 1680D Jacquard Oxford cloth look vibrant and the exterior almost has a 3-dimensional look and feel. This fabric is also much more solid and durable than the polyester material. Tough corner protectors will also help it last longer. If anything goes wrong, the warranty offered is two years by Coolife Luggage that has factories in Thailand, China, and Texas and is valid globally. You can put the documents like passport, ID and boarding pass in the front zippered pockets and you can access them easily at the airport before your flight. 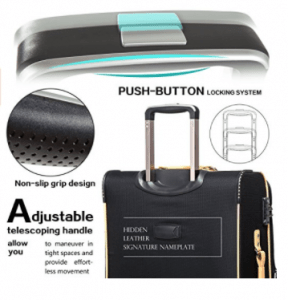 You can roll the bags easily and comfortably through the airport terminals with their four quiet spinner wheels and the internal telescoping handle. You can maneuver the bags easily in tight spaces quickly and effortlessly. TSA lock with resettable code is an added bonus as the staff at the airport do not have to break the lock to check the contents and the TSA staff can have direct access. 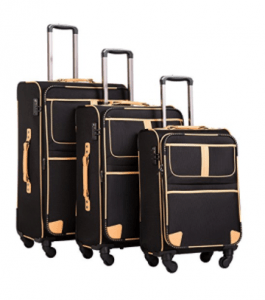 These suitcases are suitable for both frequent leisure and business trips as they are sturdy and durable with the 3color Jacquard oxford material that is resistant to wear and tear. You’ll find the tie-down cross straps on one side and the zippered mesh pocket on the left-hand side in its spacious interior with full lining. They are large enough inside and the 24 and 28-inch suitcases can be expanded by two inches. You can store each bag into each other for easy storage when you’re not using them and this is how you will get them shipped anyway. The bags look good, are very spacious inside, offer plenty of storage, are lightweight yet robust and durable and have solid wheels that roll easily with the functional pull out telescoping handles. The set offers very good value for money. Warranty is two years worldwide and there is also good customer support that is available for 24 hours during weekdays or you can contact them via Amazon.